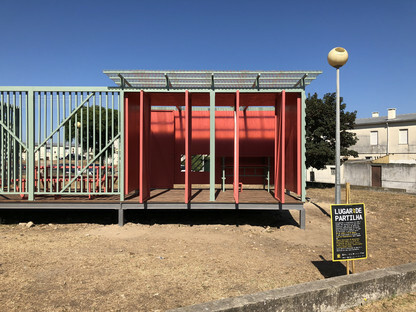 As part of the O LUGAR DE PARILHA or shared space initiative, Roberto Cremascoli from COR arquitectos has come up with the creation and do-it-yourself construction of a stylised house that doubles as a playground and a new meeting point for the local community in the city of Matosinhos, Portugal. Placemaking is one of the buzzwords of present urban planning and it is an illuminated concept if you think that cities can only become truly inhabited by creating spaces for the people who live there. Of course, a number of factors, such as latitude, funds and the client brief need to be considered in designing these places but they will all fail in their intent if their intended recipients are not involved. If we want these projects to succeed then we need to give the end users - the community - a say in the design and the creative process. This is what is known as participatory or community architecture and in the best-case scenarios, the responses are also do-it-yourself. This engages the community and when people are invested in a project and see it as something important for the neighbourhood, they will be more willing to treat it well, to look after it, to treat it as they would their own home. 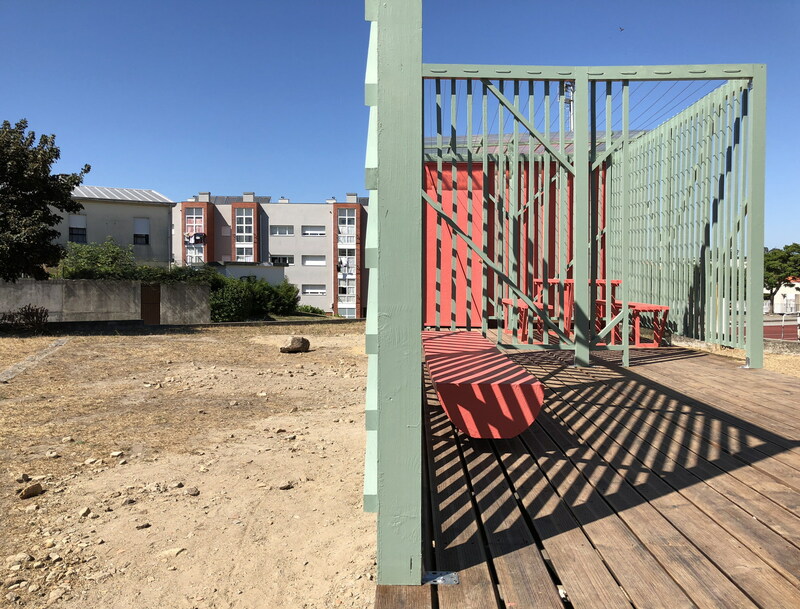 We can see one example of this approach to architecture for and with people in Bairro da Guarda, Perafita in the city of Matosinhos, 10 km north-west of Porto, on the Atlantic Ocean. 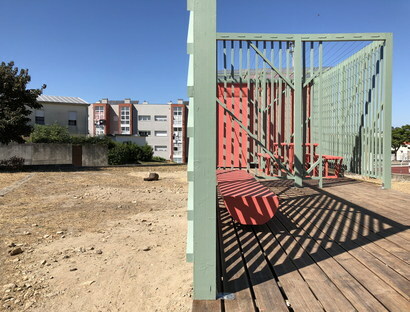 As part of the O LUGAR DE PARILHA - shared space - initiative organised by CASA DA ARQUITECTURA, the Portuguese centre for architecture, being held for the second time and curated by Roberto Cremascoli from COR arquitectos, this architecture firm together with an international group of students and the local residents designed and built a new shared place for the community. All this starting from an idea as simple as it is ingenious: the house. So now we're throwing out a challenge to our readers. How many of you remember “playing house” when you were kids? You know, building a playhouse from old sheets and whatever else you could find? Well, that's the sort of thing we're talking about here because this initiative has very little to do with the traditional playgrounds that sadly pop up around the suburbs in our towns and cities, made of prefabricated plastic games and if we're lucky, the timeless trio of swing, see-saw and slide. 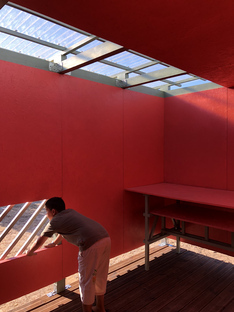 The title itself - Not just a playhouse - hints at what the team of workers had in mind: not just a place for kids to play in but a place that also meets the needs of adults, so a flexible space that can be used for a range of purposes. The end result after two weeks of work is a small building on a raised platform to keep it off the uneven ground that still needs landscaping and tree planting. Basically, this playhouse and more is a sequence of four rooms. 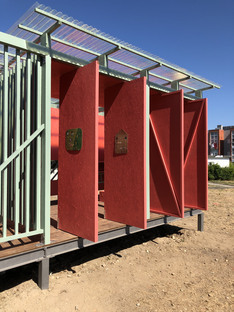 Three of them are open to the elements and the fourth has been enclosed, painted bright red and topped with a polycarbonate roof so it can be used in bad weather. When we say enclosed, it only looks like it's completely closed, because some of the walls are hinged and can be rotated to open or close it. 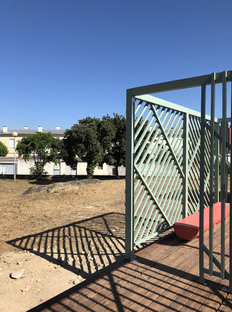 The other rooms are separated by green-painted wooden slats, reminiscent of light and airy gazebos, and giving a visual connection to the context. The handful of street furniture pieces in the Playhouse, including a picnic table and red tree trunks as benches, leave plenty of room for the imagination and free use of this structure by the community.